I found myself taking in Christina Corfield’s new work for Follies of the Digital Arcade by looking from one image to the other and back again, then repeating; piecing the images together, not unlike an early George Barnard panoramic landscape, to get the full picture of the environment the artist has created on the gallery walls. Harnessing the wonders of technology, Corfield’s world seemingly takes place in the time of the penny arcade. Set up in series, the subjects of her drawings are actors in her world, experiencing real and imagined technological frustrations in their frames. 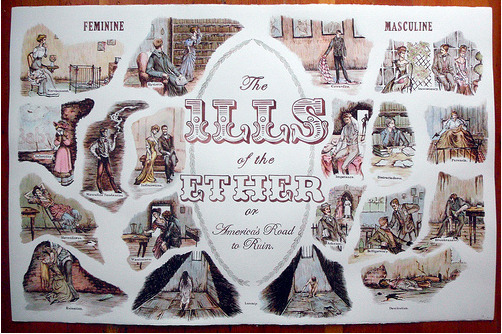 In Ills of the Ether, all works 2012, Corfield identifies some negative side effects brought by interacting with new technologies. Split into gendered categories, examples from the masculine side include “Impotence” and “Distractedness.” It is not immediately clear upon viewing what technologies have caused these symptoms, but I quickly felt trapped in the world as my phone sent me updates telling me it was my turn in multiple “Words with Friends” games which in turn made me realize I had text messages I needed to read. While there are not iPhones present in Corfield’s work, I could quickly envision myself at that moment rendered into a symptom of my own. Corfield’s Ether is no celestial paradise, rather it is an unending continuum of technological experiences, revealing the ways we may find ourselves unknowingly caught in its trajectory. Christina Corfield, Eyewitness Accounts, 2012; watercolor, ink and acrylic on paper; 9 x 12 inches. Courtesy the artist and Johansson Projects. Modern Family is rendered in a similar fashion as Ills of the Ether, displaying a series of mini-scenes where technology intervenes into family life, for the worse. I found the series Eyewitness Accounts particularly charming. 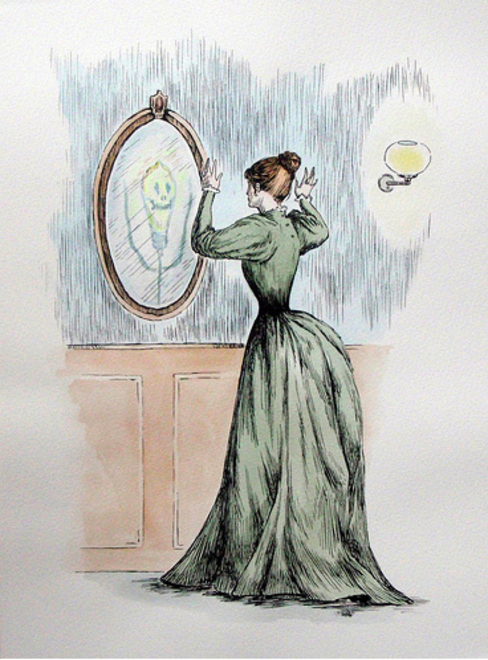 Especially one where a woman in Victorian garb peers into a mirror, reflecting her pose mimicked by a stick figure-like character with a light bulb for a head. Like other illustrations in the Eyewitness series, this piece speaks to the wonders of enlightenment that technological advances can bring but also evoke a horror witnessed when we self-referentially reflect on our dependencies. Corfield calls naturalness with which our human subservience to technology comes into question. Though I shiver in the warmth of vinyl and the perfume of old books, unfortunately, the answer is no. Top Image: Christina Corfield, Detail from Eyewitness Accounts, 2012; watercolor, ink and acrylic on paper; 9 x 12 inches. Courtesy the artist and Johansson Projects. From her artist statement at: http://tinacorfield.com/?page_id=157. Accessed February 6, 2012.